Forget the fireworks! Independence Day came early to Long Island this year and the real stars of the shows were the furry and finned participants in the Suffolk Federal’s Spectacular All American Pet Paw-Rade & Adoption Celebration. The “Paw-Rade” attracted plenty of spectators who lined up to watch four-legged models strut down the “catwalk” to show off their “All American” themed patriotic outfits. But, this event wasn’t just limited to canines, ferrets and even a fish were all about the red, white and blue. Spectator kittens watched from the sidelines while the “Pupparrazzi” made sure to get in on the action. And every furry and finned fashionista went home with a Celebrity Swag Bag designed by Suffolk Federal and filled with an abundance of fun gifts and surprises. Suffolk Federal capped off the wildly successful event by donating over $3,000 to local animal rescue and welfare charities who were in attendance to support their work and their missions. In addition, an abundance of food and pet supplies were collected and donated to Baxter’s Pet Pantry through Long Island Cares – the Harry Chapin Food Bank to provide support to family pets in need through their network. Many animals found new homes following their freedom strut including Dory the Fish who was adopted by a young boy who traveled all the way from Massachusetts for the free outing. Reef Scape Aquatics of Huntington donated the little pet and even provided a take-home aquarium for Dory’s new adventure. 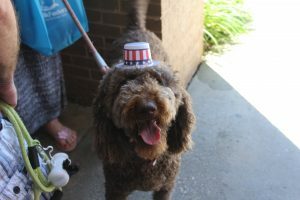 “We had so much fun during our All American Pet Paw-Rade and Celebration. We are grateful for the rescues and organizations who participated in the event and helped make it such a success,” explained Ralph D. Spencer, Jr., President & CEO of Suffolk Federal. “Being able to give back and support the mission of the organizations who joined us and who provide a much needed and vital service for our pets and rescues is such an important part of our mission to support the community. We were also happy that we could help so many pets find their new ‘Best Friends’ and a special home,” he continued. The All-American Pet Paw-Rade & Adoption Celebration was created by Suffolk Federal to encourage pet adoption and build awareness for the efforts of local rescue and welfare groups to protect animals while promoting humane treatment, offering education for responsible animal ownership and care and providing crisis programs for animals in need. PHOTOS: Spectators and pets anticipated the excitement as they lined up to watch four-legged models strut down the “catwalk” to show off their “All American” themed patriotic outfits during the Suffolk Federal’s All-American Pet Paw-Rade & Adoption Celebration.